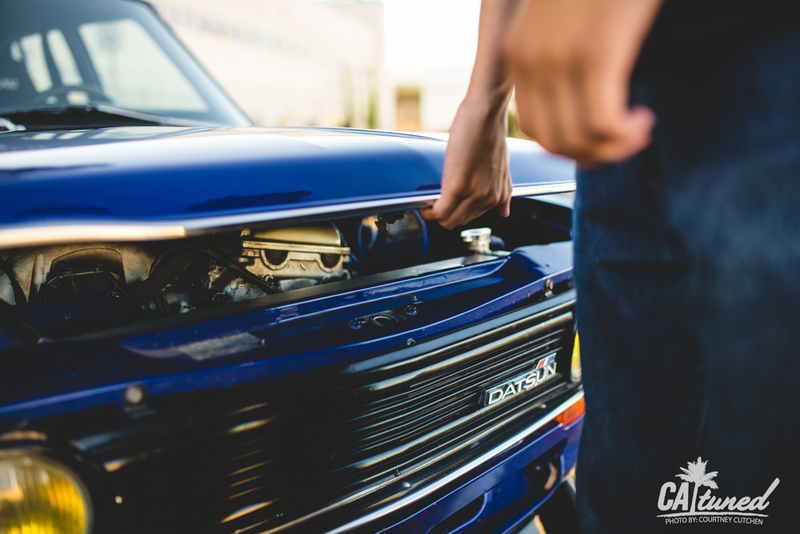 In today’s car scene, there are various styles that people follow when modifying their cars. In general, it can be categorized into two (albeit large) groups: form and function. I have heard countless arguments between enthusiasts from each group, and good points can be brought up from both sides. What I tend to ask myself is, “Why can’t we have both? Why can’t there be a happy medium?” Well, the answer to my question rests with several builds off the top of my head. 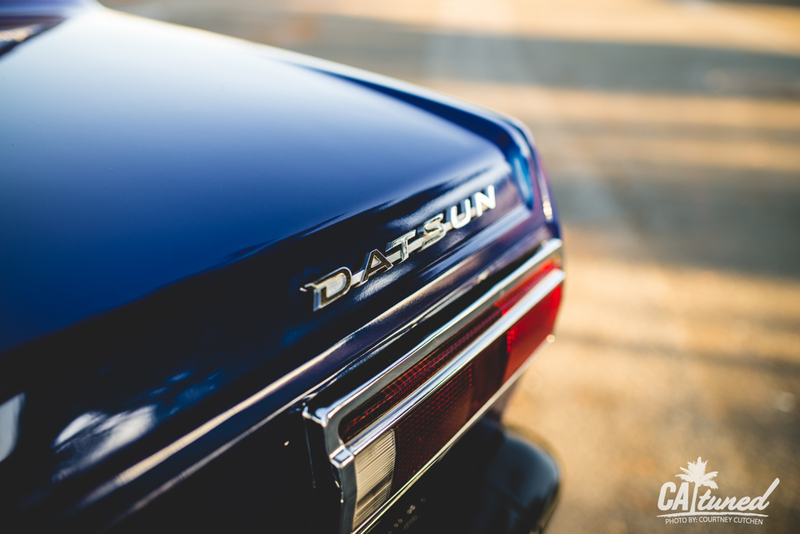 Dustin’s 1972 Datsun 510 is one of them. 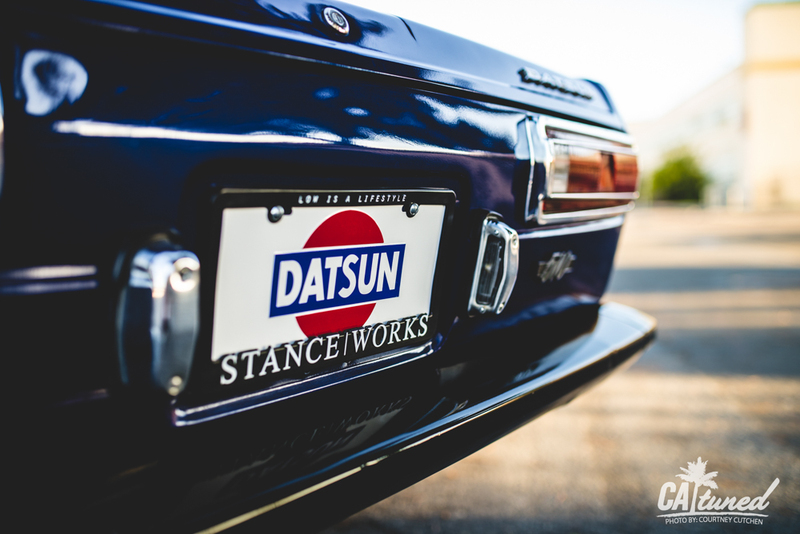 When he initially began searching for his next project, Dustin had just sold his previous daily, a 2002 Miata. Standing at about 6’3”, he found that the tiny convertible just wasn’t doing the job anymore. It’s not much fun to drive when your knees are in constant contact with the dash. This said, he was in the market for something roomier. 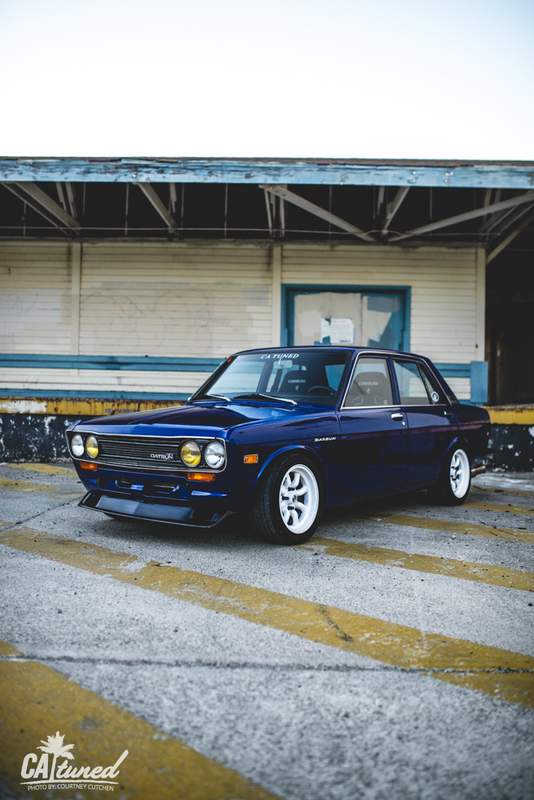 He started with two ideas in mind: either a Subaru or a Datsun. 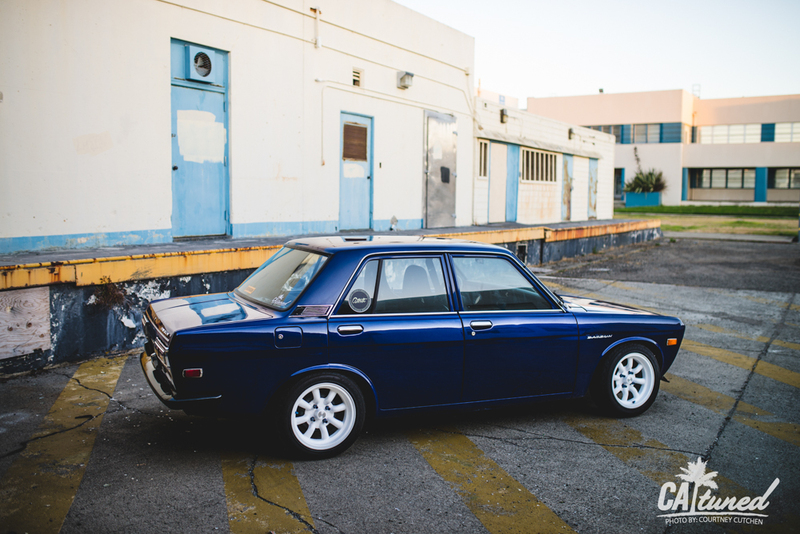 At the time, the Subaru (which would have likely been a GC8 because of its practicality and drivability) seemed more feasible than the 510. 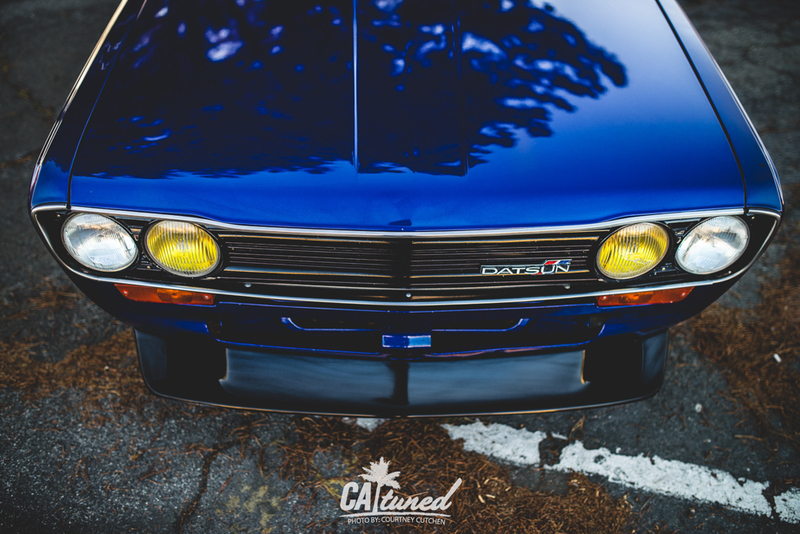 If you know at least a little about Datsuns, you know that they aren’t getting any cheaper. The plan was to find a decent platform of a Subie, fix what needs fixing, and enjoy the ride. But then, it happened. Dustin began his journey with “the Dime,” as he had affectionately dubbed it, with an eager mindset. He had bought one of his dream cars. However, the more he looked at it and the more he worked on it, the more he found aspects that disappointed him. For example, right off the bat, he figured out that the motor swap had been done, but sloppily and in some ways, incorrectly. The bolts that linked the transmission to the motor were missing all but two, and the wiring was messy. The radiator needed to be replaced, and the differential sounded like it was in constant pain. Additionally, it was a completely wrong gear ratio. The car leaked every fluid that was in it—literally. Oil, coolant, brake fluid, you name it, and it was in a puddle on the ground. Sadly, this is the territory that comes with buying cars like this from other owners. Unless you find a completely original gem, it will have been tampered with and “modified.” But with love comes pain, and Dustin rolled up his sleeves without a single thought of abandoning the old classic. 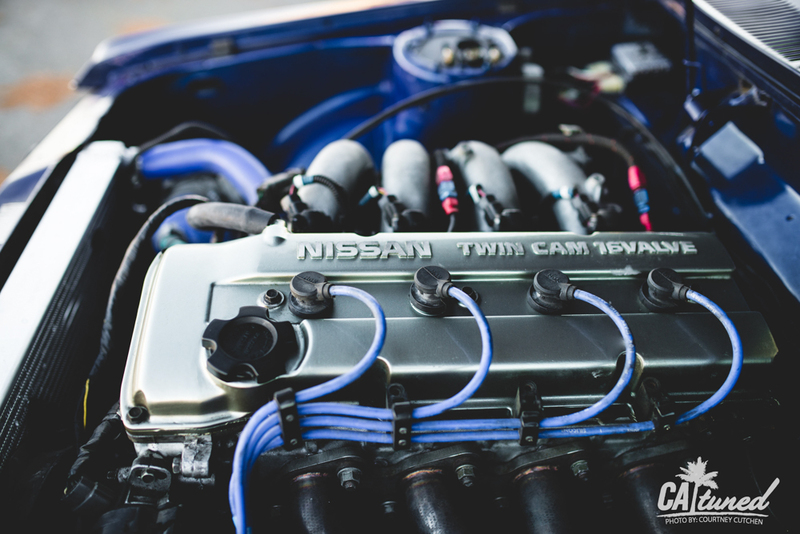 As aforementioned, under the hood beats the heart of a 240sx. The lightweight car combined with a decently more powerful motor (compared to the stock L16) makes it a blast to drive. It’s quick, exhilarating, and raw. All around, the car feels solid. Nothing really creaks, rattles, or clangs, which is a huge bonus. There isn’t much to be said for the sound barrier though, so if you like to hear your motor while driving, this is the car for you. A lot of work was done to get this car to function as well as it does. Dustin made it a goal of his to swap out the less than desirable differential that he had before with something able to handle more power. It took him a while, but he finally found a good condition 2007 STi diff. In addition, he swapped in an upgraded aluminum radiator, clutch and flywheel (done at CAtuned), and fixed the fluid leaks. 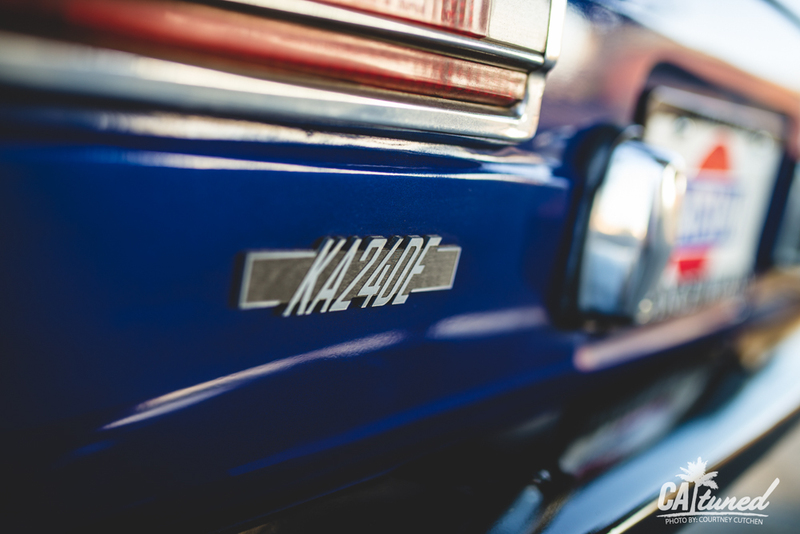 One aspect of my automotive subjects that I always like to pay close attention to, is detail. Detail in the interior, in the wheels, in the body. 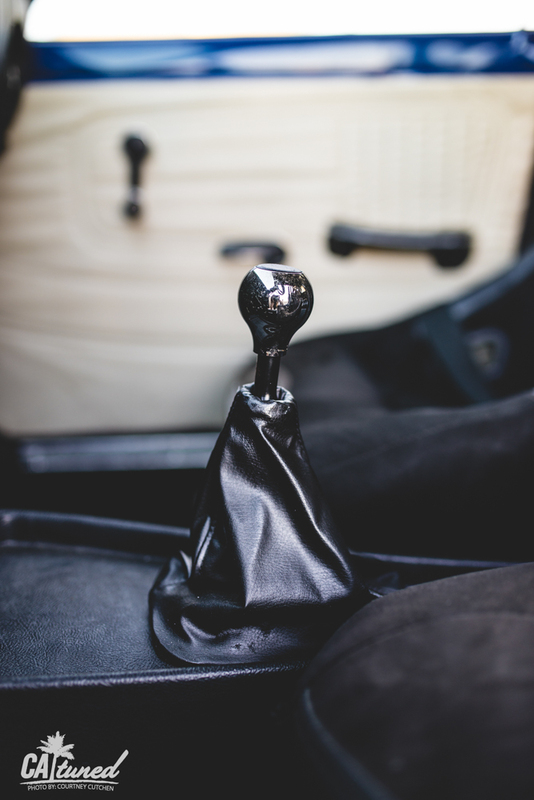 Without craftsmanship and passion, what is a good car left with? If you ask me, not much. Let’s start with the interior. It’s a part that many people seem to love. 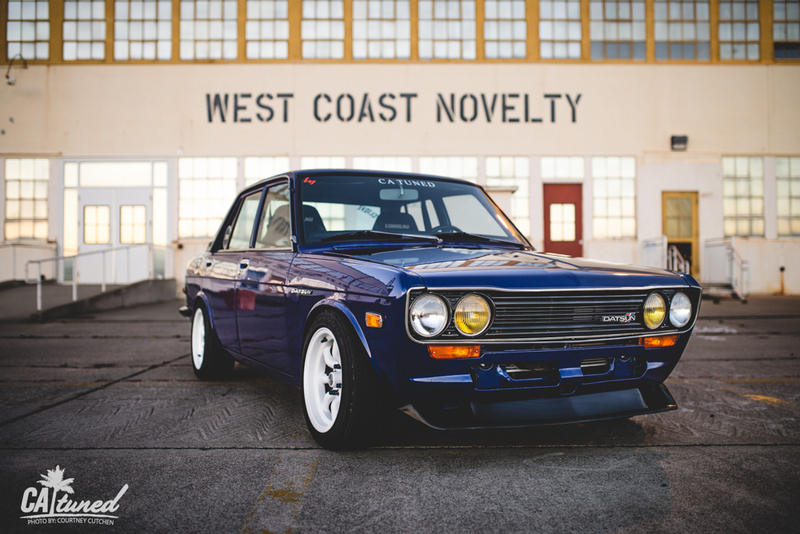 It radiates the type of resto-mod style of the car, while still being comfortable and practical. 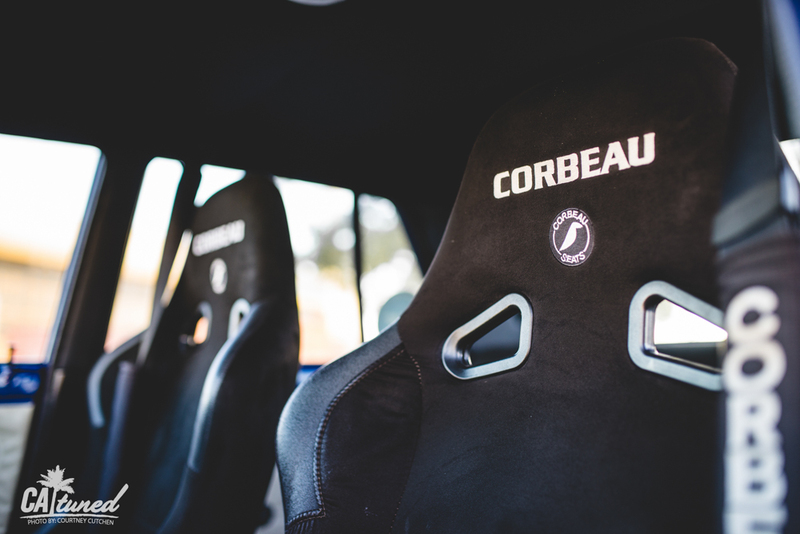 The Corbeau front seats and bench rear seat compliment the light tones of the off white door panels. 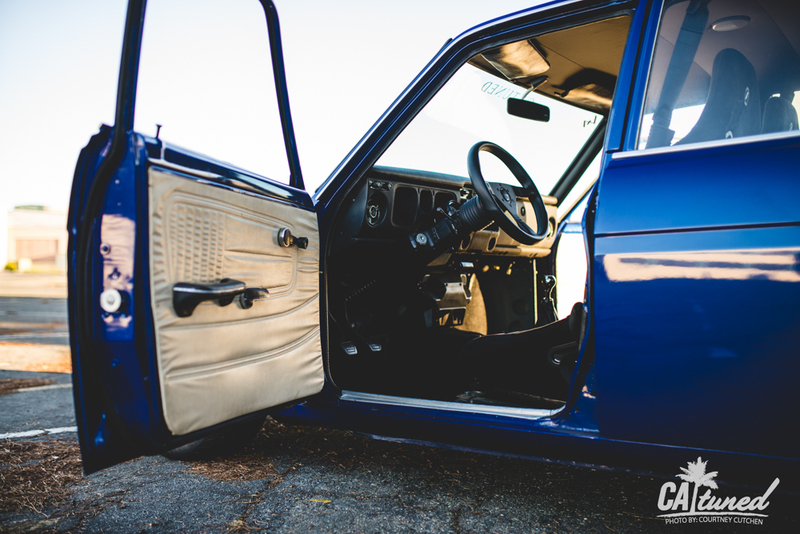 The car came with the stock 510 steering wheel, but Dustin wanted something sportier and more easily handled under intense driving conditions. He replaced the original with a beautiful leather Momo wheel, with a solid NRG adapter. The car has changed a lot since Dustin bought it. For both aesthetic and performance purposes, he decided to lower it just a bit. It wasn’t stock height when he got it, but it definitely was missing something. It is lowered on specialty coilovers and camber plates from a local 510 expert and racer, Troy Ermish. When Dustin got the car, one thing he knew was that he didn’t want a stance machine. While he enjoys a slammed car just as much as the next guy, he holds to the idea that these cars aren’t meant to be street sweepers. 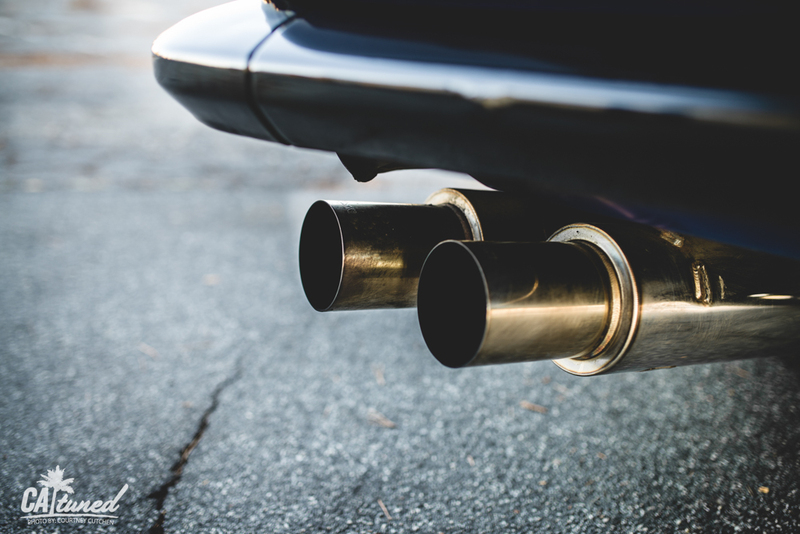 They aren’t as replaceable as a lot of the cars of today, and it is definitely not cheap or easy to repair body damage and other major issues. “I drive the car a lot,” Dustin says. “It’s both my daily and my weekend car.” This means that he has to be even more careful. Owning the 510 has been a journey so far, but you feel a sense of gratification when there are so many people who appreciate your work. That said, if you own an even moderately classic car, you know that it gets a lot of attention. 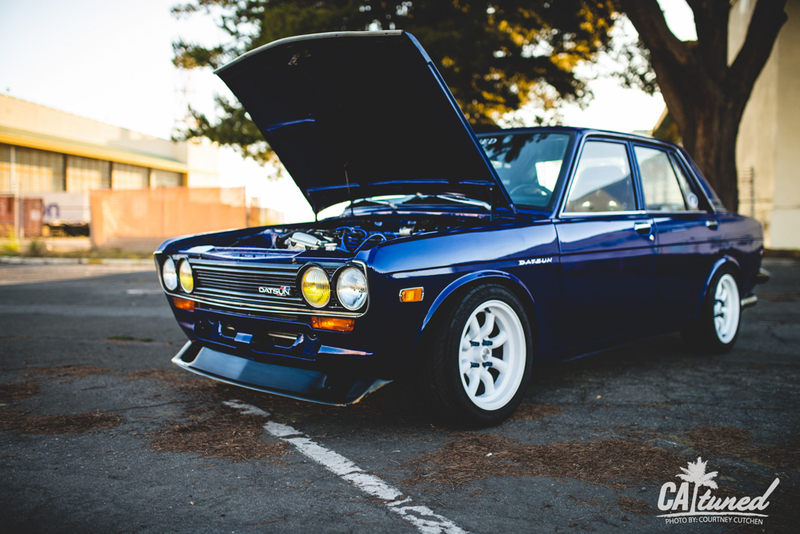 However, if you own a Datsun, it’s on a whole different level. Dustin can’t count the times people have approached him at the gas station, given thumbs up and taken photos on the freeway, and even followed him home just to tell him their stories about the iconic cars. One man on the freeway even went as far as trying to buy the car off of him as they drove side by side. Dustin has the Dime’s future all mapped out. In addition to different wheels, he is also going to invest in a big brake kit, as well as eventually repainting it. There are other plans in the works, but we have to keep a little mystery. Over the course of his life with this car, I have seen him smile harder than anyone, and at the same time, curse it to no end. That’s the nature of building a car, though. What matters is whether or not it truly makes you happy at the end of the day. If it does, then you’re on the right track.